CHARLESTON, SC--(Marketwired - Oct 31, 2016) - Charleston, South Carolina is ready to come alive in celebration of the holidays! The Residence Inn by Marriott Charleston North/Ashley Phosphate invites guests to discover everything the city offers this coming season. Located just 17 minutes from downtown and only 6 miles from the area's best holiday shopping, the North Charleston hotel is primed to bring guests within easy reach of all the festive celebration. Spacious suites create a warm holiday refuge for families with separate living and bedroom areas, and full kitchens for baking cookies or preparing warm, home-cooked holiday meals. Wake up every day to a freshly-prepared hot breakfast buffet of waffles, scrambled eggs, sausage and much more before setting out for a day of holiday shopping. Give thanks as fall arrives in Charleston with beautifully mild weather that lets you take in all the area's sights. Play a round of golf on some of the region's best courses, spend the day on the beach and dip your toes in the sand while friends back home shovel snow. Celebrate Thanksgiving in the comfort of your suite and craft the perfect holiday meal in your kitchen, or experience the culinary wonders that await at local award-winning Charleston restaurants. You'll find over 50 eateries and popular dining spots within three miles of the hotel. Celebrate with us after Thanksgiving as the hotel gets decked out in holiday cheer, putting guests in the mood for some of the area's best holiday shopping. Find the perfect gift by browsing downtown Charleston's festive shops and malls. Stroll around the town, taking in beautiful holiday decorations, as the city is dotted with silver and gold. Our extended stay North Charleston hotel puts you within moments of all the top holiday sights and sounds. Ring in 2017 in vibrant Charleston near AFB and Summerville, and pop some champagne this New Year's. Whether planning a lively gathering or a quiet retreat with someone special, the Residence Inn provides the perfect backdrop for your New Year's escape. Located only minutes from downtown, you'll find yourself close to all the city's New Year's events. Transportation is easy, quick and affordable if you need a ride home, and if you're in need of a late-night bite, our 24-hour market is the perfect refuge to come back to after a night of celebrating. The Residence Inn Charleston North/Ashley Phosphate is a pet-friendly, extended-stay hotel, with suites intuitively designed with separate spaces for working and relaxing, as well as a fully-equipped kitchen for convenience. Guests enjoy unrivaled amenities at this North Charleston hotel, including free hotel-wide Wi-Fi access, modern business facilities, and a heated outdoor pool. Travelers can start the morning with a workout in the hotel's fitness center, or take a break from the kitchen and enjoy the property's free, hot daily breakfast. The city's top destinations are just moments away from the hotel, making it easy for guests to explore. The hotel is close to the North Charleston Performing Arts Center, SPAWAR, and the Naval Weapons Station, as well as the towns of Summerville and Goose Creek, shopping and local dining. 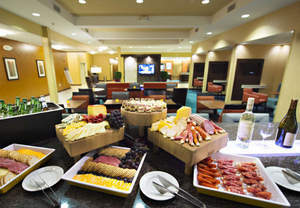 Celebrate the holidays with the Residence Inn Charleston North/Ashley Phosphate.